If you take a moment to think about it, your infant has a lot in common with a koala bear. They're both cute, cuddly, and totally adorable. And as a mom, it's just natural to feel the need to have your baby attached to you at all times. Well, luckily we've found a costume that accentuates your child's cuteness while making it as convenient as possible for your child to stay attached to you. This Huggables koala costume for infants satisfies all of your baby costume concerns. Clinging to your child is now a whole lot easier with this unique design. 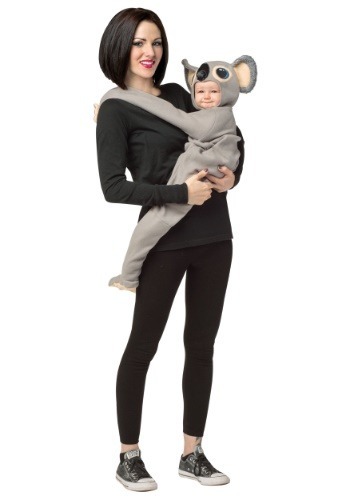 Just slip your baby into the soft fleece costume, use the Velcro tabs to situate it around your neck, and fasten the matching hood under your baby's chin and you now both have a cute costume that's easy to move around in; you're a zookeeper and your baby is a sweet koala! Just think of all the fun things you and your baby can do with this one-of-a-kind animal costume. Pretend to go on a safari while you're trick-or-treating through the neighborhood or start talking in your best Austrailian accent. Your little one can't talk yet but we're sure he or she is great when it comes to making strange sounds like a real koala. It's the perfect costume for moms who want "koala-ty" time with their babies on Halloween!